This publication consists of three papers that were produced in the 1990s as part of the work of the European Commission's Childcare Network. This work was situated within a set of European Parliament and Council of Ministers resolutions, directives and recommendations with regard to the child care dimension of the European Union's commitment to equal treatment for men and women in the labour market. Within the context of the Childcare Network's decade long work on child care, these papers were developed within the specific task given to the Network of "establish[ing] criteria for the definition of quality in childcare services." 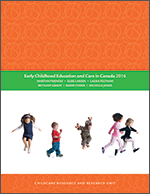 The quality of the discussion on this topic contained in these papers makes them of substantial and continuing interest to those concerned with early learning and child care in countries such as Canada that are not part of the European Union. As the papers were no longer available in print nor accessible electronically, the Childcare Resource and Research Unit sought permission from the European Commission to make the papers available to a wide audience.